Amazing views from this newly updated 4 bedroom, 4 bath South Beach Villa! This recently renovated villa sits 6 feet above the other South Beach Villas allowing for spectacular views of the Calibogue Sound. Located on the first floor is the kitchen with Corian counter tops and new appliances. The dining area has a large table with seating for up to 8 people. Next to the dining area is a screened in porch with plenty of comfortable seating. The perfect spot to take in the beautiful views that abound from this villa! The living area has plenty of seating for everyone in the family! Access your private deck from the living room. The deck offers magnificent views of the Sound, as well as a grill for cooking the perfect steak! Also on this level is a bedroom with 2 twin beds and a TV. A hall bath is shared by this bedroom and the main living area. Upstairs on the 2nd floor are 3 more bedrooms. To the right of the top of the stairs is a bedroom with 2 twin beds and a private bath. Down the hall is the master suite with king bedding, en-suite bath with double granite vanity and shower/tub combo. This bedroom also has a private deck for you to enjoy the views of the Sound while drinking your morning coffee. Next to the master suite, you will find a bedroom with king bedding and a private bath with granite vanity. The stunning views and all the amenities of South Beach make this the perfect place to vacation. Just a short walk to the South Beach Marina Pool, shops, restaurants, and water sports. 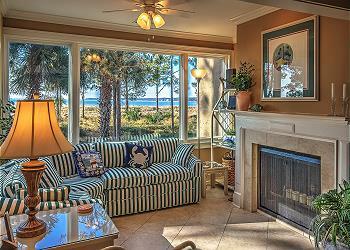 This is the best oceanfront value in Sea Pines. •	The Vacation Company App will contain all of your check in information (lock codes, Wi-Fi Codes, and other pertinent information about your vacation property).